Eric Blackwell returned home from Summer League ball in June 1988 and he learned he'd been drafted, he recalled years later to The Manning Times. He also recalled being excited at the team that selected him: The Dodgers, he told The Times. "It was so special because growing up my grandmother was a big Dodgers fan," Blackwell told The Times, "and she just passed away the year before. I knew she was in Heaven looking down on me with a big smile." While Blackwell made it to the pros, he didn't end up with a long career. He played three seasons in the Dodgers system. He didn't make AA. Blackwell's career began that year in 1988, taken by the Dodgers in the 42nd round of the draft out of Spartanburg Methodist College in South Carolina. Blackwell went to Spartanburg Methodist out of Manning High School. He made the local Hall of Fame in 2016. At Spartanburg Methodist, Blackwell went 3 for 4 in an April 1989 game and knocked in three. Two of those hits were home runs. Blackwell started with the Dodgers in 1989 in the rookie Gulf Coast League. He hit .232 in 45 games. He also put up 14 RBIs and stole 16 bases. He moved to rookie Great Falls in 1990. He hit .313 in 60 games there. 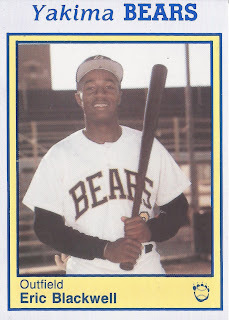 Though he got a card at short-season Yakima in 1990, he isn't credited as getting into a game there. Blackwell returned for 1991 and saw three different teams, but only 13 total games. He saw four games at high-A Bakersfield, four at high-A Vero Beach and five at Yakima to end his career.